The DeTour Reef Light Preservation Society is proud to present the 18th annual Father’s Day River Cruise on the St. Mary’s River. 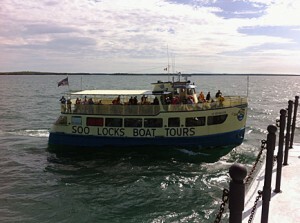 The cruise is operated by Soo Locks Boat Tours from Sault Ste. Marie, Michigan, and provides a comprehensive, narrated tour of the St. Mary’s River. Along the tour you’ll get to see the DeTour Reef Light up close and conclude the tour with a trip through the historic Soo Locks. Father’s Day is Sunday, June 21, 2015. The cost of the trip is $95 per person if booked prior to March 1, 2015, and $105 if booked March 1, 2015, or later. Your trip will include a narrated tour, breakfast buffet, lunch, afternoon snacks, and a chance to win door prizes. Soo Locks Boat Tours will also be providing a cash bar. A portion of your ticket price is tax deductible, and all profits will be used for restoration and preservation efforts of the DeTour Reef Lighthouse. Boarding begins at 9:45 AM at the DeTour Ferry Dock with departure at 10:05 AM. The boat tour concludes at Soo Locks Boat Tours Dock #2. Options for departing from Sault Ste. Marie in the morning or returning to DeTour Village at the end of the cruise are available. See the Father’s Day Cruise Application below in PDF format for additional information. Treat Dad this year with a trip on the historic St. Mary’s River, the Soo Locks and the DeTour Reef Light! Drummond Island, Michigan - Lodging, Travel and Recreation - produced by North Guide Internet.